These two tapestry kits are based on an unusual design for a sofa seat attributed to William Morris and his apprentice and successor Henry Dearle. A watercolour of the design (1880-1890) is at the William Morris Gallery. 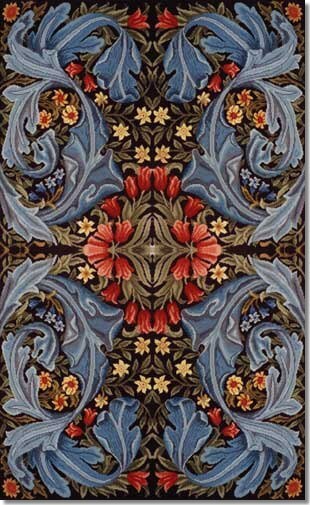 A panel was woven in about 1910 by Morris & Co after the death of Morris and while Dearle was running the company. 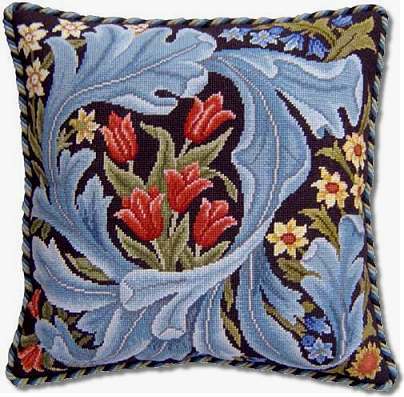 The kit uses Appletons tapestry and crewel wool on 12hpi canvas and measures 16" (41cm) square. The kit uses Appletons tapestry and crewel wool on 12hpi canvas and measures 15" x 48" (38 x 122cm). It makes a superb cover for a piano stool, window seat, headboard, foot stool or carpet runner. The kit uses Appletons tapestry and crewel wool on 12hpi canvas and measures 30" x 48" (76 x 122cm).